"So who is your client? It could be a couple or a single person, and usually as you will read down the track, the leader of the renovation process is the woman. Is there any difference between men and women when it comes to buying a kitchen? I found that there are no courses of how to become a professional buyer, but there are courses about how to become a professional seller. Maybe because buying is a complex process we all handle greatly, more or less spontaneously, and the decision of buying or not comes from our ‘guts.’ It is part of our job as designers to understand our client’s behavior and maximize the communication with him"
Extract from Module 4-"The Client"
Want to learn more about buyers habits? He wanted to be a painter, in the end he preferred architecture, which for him is'' visual art, image production.'' Jean Nouvel is the last of the existentialists, its black color, the cinema source of inspiration. He is an architect of the present. After graduating from the National School of Fine Arts in Paris in 1972 by Jean Nouvel opened his own studio. The turning point came in 1981, when he won the competition for the Institut du Monde Arabe in Paris. Since then he has received many awards, the Grand Prix National d'Architecture at the Gold Medal of the Royal Institute of British Architetcts up to the Golden Lion at the Venice Biennale. In 2008 he was awarded the prestigious Pritzker Prize, the Nobel Prize for architecture. The activity of the Atelier Jean Nouvel's design reflects the desire to develop a "design of architecture," objects that fit the spirit of the time. Not surprisingly, the first approach stems from the Nouvel to design objects to create their own architectures: the Less tables, for example, produced by Molteni & C., were designed for the Paris office of the Fondation Cartier pour l'Art Contemporain. The house becomes an urban landscape, architectural structures defined by simple and basic. In Milan, between April 17 and 23, 2007, Jean Nouvel - one of the most creative and challenging architects in the world - has presented “Corian® Nouvel Lumières”, a fashinating multi-sensorial interior environment that, through six “domestic themes” (kitchen, dining room, library, living room, bathroom and bedroom) creatively and elegantly explores the interactions of Corian® with light. “Corian® Nouvel Lumières” is a project organized and sponsored by DuPont™ Corian®. Main partners of DuPont™ Corian® for this exhibition are Targetti (lighting solutions), Legrand and Bticino (domotic systems), Ernestomeda (kitchen), Margaritelli/Listone Giordano® Contract (wall pannelling and flooring systems), Scholtès-Indesit Company (built-in appliances), Hasenkopf (fabrication of Corian®) and Marotte (special decorative panels). Banco (Counter) an old name for a contemporary kitchen. A large table is equipped with everything you need. Tour is essential, ergonomic and functional. The self-supporting structure, made is entirely of aluminum, supports the suspended containers with interior finish in mat lacquer, which gives the container a unique elegance. The floor is home cooking systems, sink and other accessories. You can compose elements with differentiated height, to be chosen according to the needs of the project. In addition to the aluminum bright, the kitchen is complete with two stunning finishes, created for maximum integration with design projects: painted white and black anodized. Informal, pragmatic and without frills. It has the technology you need, a concrete quality, functional, efficient and without excess. It's simple and substantial, consistent and accessible, with openings ergonomic, durable materials, easier cleaning and maintenance . But it has details of its design and functional. Is innovation know-how Dada and has the best technological solutions for building systems, finishes and accessories. It is versatile for the wealth of accessories and components. It is robust and reliable in time for the system of bars midway, the handles in extruded aluminum, the upper edge of the doors and drawers. It is sober and discreet but lively, with bases, doors shelves and wall columns mat lacquered, embossed in white / color, and white laminate top / color. It is the perfect combination of a few simple elements combined in a wide modularity that makes it easy to design and installation. We do not know with certainty even when it begins, as the stories that are handed down from father to son. Sailing is history, a classic. It has so many lives, and turns to be always up. Stylish and solid as steel, pure and clear as crystal, clear as water. It's technology with discretion, a certainty in the center of the house. cloud draws the surfaces with strong unit. It's all there, in the continuity of the panels, the thin plot lines of division. Reduces the variety in a penalty and it was the first essential kitchen suspended. Practical, hygienic, easy, elegant. A real lady timeless. 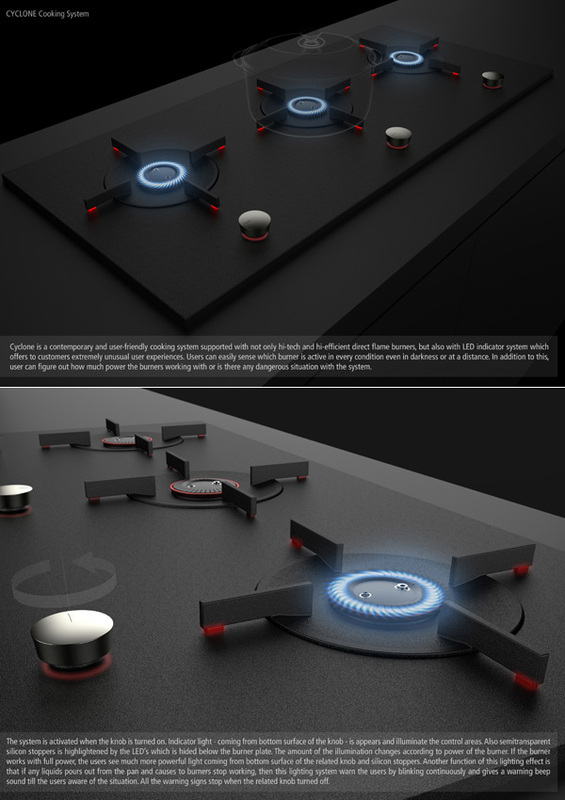 The Cyclone Cooking System is quite a contemporary take on existing burners and cook-tops. 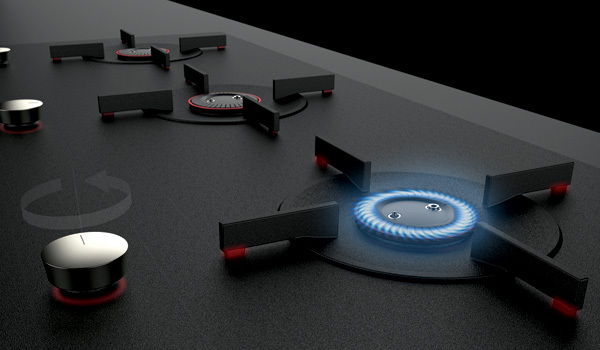 Integrating high-tech features, you can expect the high-efficiency direct flame burners to make cooking a pleasurable and relatively a faster process. The LED indicator system is especially cool! Turning the knob activates the system, and an indicator light (coming from bottom surface of the knob) illuminates the control areas. 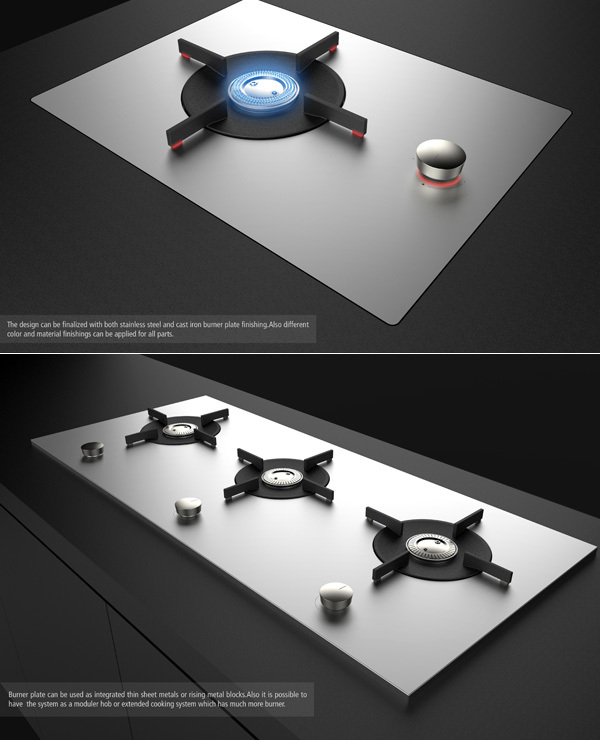 Translucent silicon stoppers are highlighted by LEDs that are hidden below the burner plate. The amount of illumination is calibrated to the power being consumed by the burner. If the user supplies full power to the burner, intense light will be seen beneath the knob and on the stoppers. At low power, a less intense light will be seen. The burner in use can be easily detected, even in dark conditions. If any liquid spills from a cooking pot and douses the burner flame, the lighting system will blink continuously. A beeping sound will also alert the user to the situation. All the warning signals stop when the related knob is turned off. 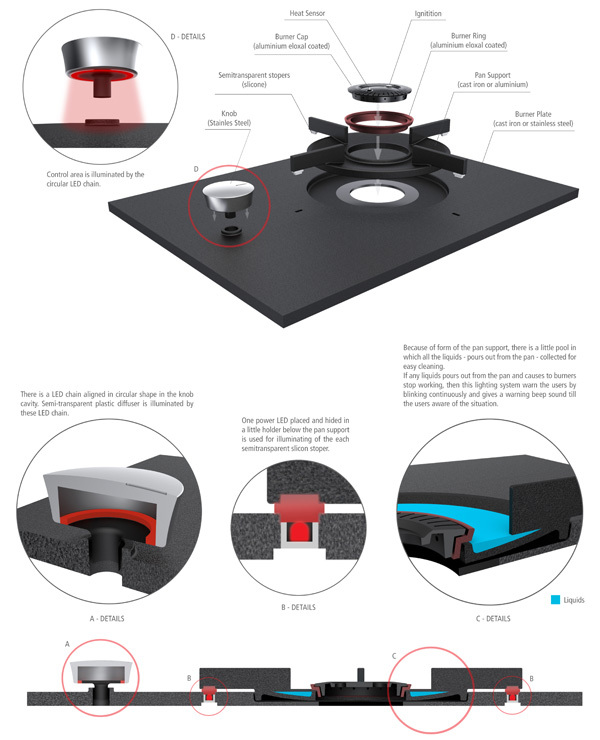 A concave base plate collects any spilled liquid at the centre for easy cleaning. The burner plates can be made with stainless steel or cast iron, and shaped as thin sheets or metal blocks. Other parts of the system can be finished with different colours and materials. The high-efficiency direct flame burners can be finished with two kinds of burner capping designs. One has slanted grooves that generate a flame with a rotating movement effect. The other is perforated and produces a smooth flame effect that rises directly from the holes. Designed for a family of eight, this outdoor kitchen is on the lower level of a three-storey penthouse apartment. Glazed walls and automated motorised louvres enclose the space as required. One could be forgiven for thinking that what you see is what you get when you buy an apartment. But, as this project shows, sometimes it's possible to extend living areas outdoors by semi-enclosing a terrace. When Christchurch kitchen designer Ingrid Geldof was commissioned to design the new outdoor kitchen for the owners of this three-storey apartment, the large terrace had already been enclosed by glazing on three sides. In addition, a new roof with automated louvres and rain sensors had been installed. "The owners – a family of eight – spent quite a lot of time on the west-facing terrace, but the space wasn't maximised," Geldof says. "They wanted an informal outdoor entertaining area with kitchen and dining facilities, and a television." Providing an expansive steel benchtop on the island as well as a saligna eucalyptus bar top ensured there is plenty of room for food preparation and service. "The bar top is wide enough to accommodate plates and drinks," says the designer. "However, as there is no water plumbed to the terrace, all the clean-up is carried out in the main kitchen." Waterproofing the kitchen was a priority, although the louvres automatically close when moisture is detected. 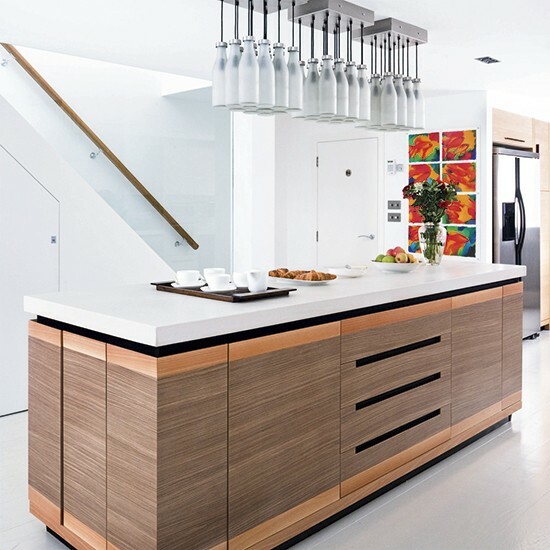 The cabinets are made from marine-grade stainless steel, which is wrapped around marine plywood. And the wood bar top and furniture can withstand water. Over 50 years have gone by since Fagor took its first steps thanks to five student entrepreneurs. Following its purchase of the Brandt Group, Fagor Electrical Appliances is Europe’s fifth largest manufacturer of electrical appliances, with a market share in Europe close to 6% and a turnover of more than 1,498 million euros. The Fagor industrial group invoices over 1,700 million euros a year and has 11,000 employees. It has 16 production plants in Spain, France, Italy, Poland, Morocco and China and 17 subsidiaries around the world, and its products are marketed in over 100 countries. The group’s overall production exceeds 7 million electrical appliances. Fagor is a member of the world's largest cooperative group, Mondragón Corporación Cooperativa (MCC), one of Spain's leading corporate groups, with a turnover of 13,000 million euros, and figuring among the seven largest groups in the Spanish rankings. MCC embraces 220 different companies, with a total of over 80,000 employees, and is structured in three large groups: financial, distribution and industrial, headed by Fagor Electrical Appliances. The solidity given to it by this large group enables Fagor to maintain its line of expansion during the coming years. Fagor Australasia is a fully supported extension of the Fagor Industrial factory in Spain and has been selling Fagor products throughout Australia since 2000, supported by a network of worldwide factories. Fagor’s One Brand, One Solution capability means that the brand can fulfill any commercial catering need, no matter how big or small the project is. Fagor is able to supply an entire range of products at very competitive prices with an extensive warehouse ready to deliver stock and spare parts to any chosen location. The equipment is always easy to clean and care for and designed to be stylish, functional and ultra reliable. Yes for the sum of design features, especially the milk bottles chandelier, the innovative colour scheme, the sculptural look of the island. 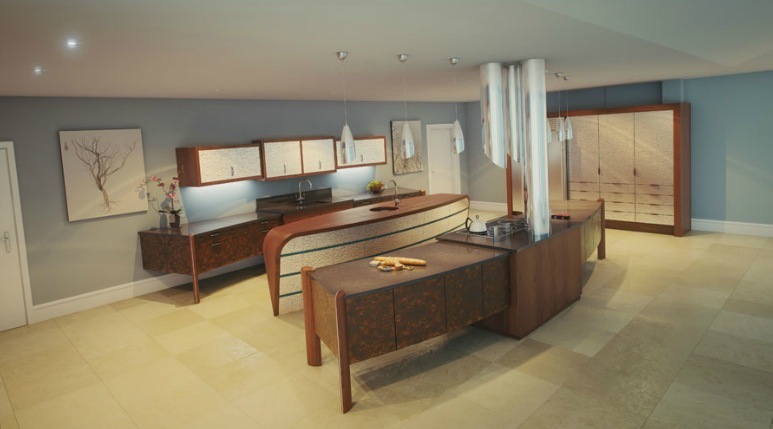 Ever wondered how a contemporary take on Fifties furniture could look like and design a kitchen out of it? This is how! Any thoughts?